Greenled headquarters is a two-storey building with a reception area, meeting rooms, office spaces, production facilities and warehousing. Altogether, the premises consist of 3500 square meters, located in Kempele, northern Finland. When the company moved in 2015, the whole building was lit with T8 fluorescent tubes. 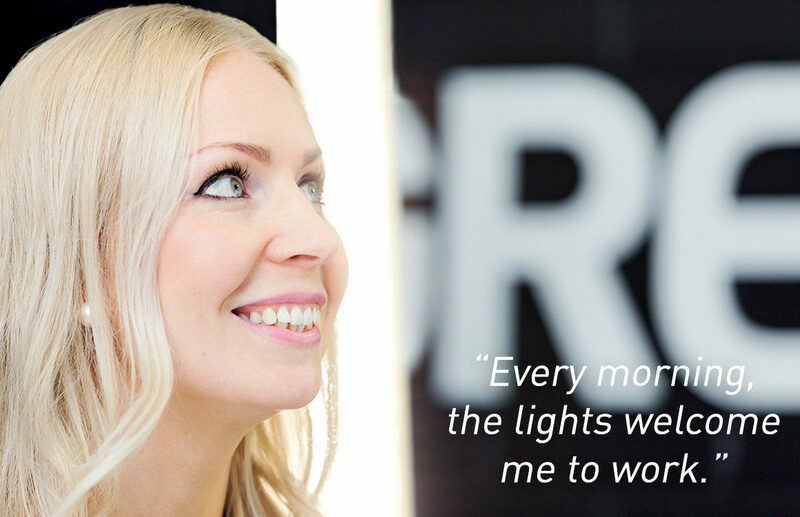 Straight after the busy moving period, Greenled started renewing the lighting of their new premises. The T8 fluorescent tubes were upgraded to LED technology, offering a lighting solution with a greater choice of user options and homogeneous light levels. Improving light quality is known to have a profound effect on workplace safety, productivity and comfort. Today, the luminaires and lighting control have been carefully chosen to fit the tasks and the working environment of each space. All of the old fluorescent tubes were replaced with energy-efficient Greenled luminaires and the lighting is controlled via the ENCELIUM™ light management system, an award-winning light control technology provided by Greenled’s trusted partner OSRAM. Greenled chose the ENCELIUM™ light management system as it offered the flexibility and control options needed for the premises. As you will learn later in this case, the ENCELIUM™ system allows Greenled to automatically set up light levels based on production windows and breaks, bringing added energy savings and ease of maintenance. Moreover, the 3D visualisation of the premises gives property managers a great overview of the state of the lighting, predicting maintenance needs and highlighting any problems with the lighting. In the office spaces, the Alfa Q and Alfa Line luminaires provide style, appeal and comfort. The luminaires detect motion, adjust to daylight and provide tunable white options to set up light tones in the meeting rooms. Daylight harvesting and occupancy control help maximise energy savings and assure a comfortable working light. The production facilities and the warehousing area use different variations of Omega luminaires to ensure sufficient light levels at different working stations. The output and optics of the luminaires have been tailored based on the ceiling height, work tasks and other requirements. The production facility has several assembly lines where all Greenled luminaires are put together. With different working stations, the production team assembles and carefully tests each luminaire leaving the factory. After testing, the luminaires are packed and ready to be sent to customers. With regular production windows, lunch hours and breaks, the big production space mainly relies on task tuning as an energy saving strategy. When production is in progress, the lighting is set at a high level to assure safety, accuracy and efficiency. When a break begins, the light levels automatically drop to 30 % of the maximum. The output of the luminaires and the exact schedules of task tuning are programmed straight in the ENCELIUM™ light management system’s software. 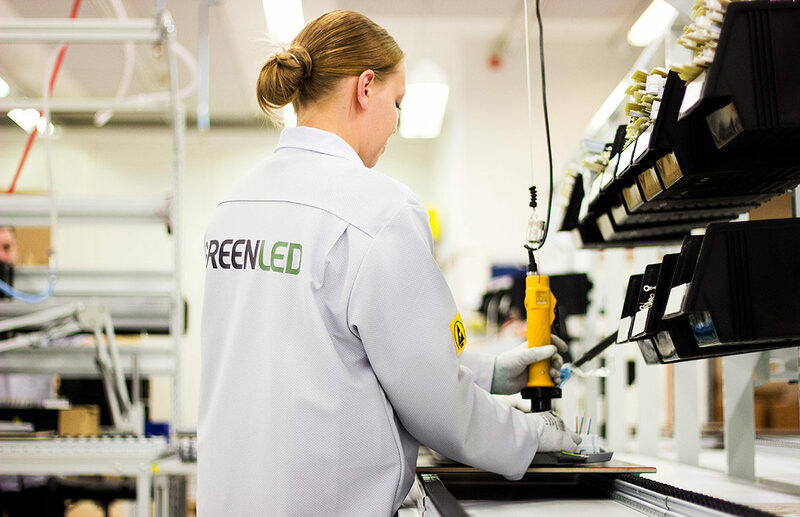 Image: With different working stations, the production team assembles and carefully tests each Greenled luminaire leaving the factory. The centralized, 3D software of ENCELIUM™ shows a visualisation of all the spaces at the headquarters. It facilitates the commissioning, usage and data analysis of the lighting installation, showing just how efficient the installation is. Image: At Greenled HQ, adjustable LED lighting with task tuning saves up to 75 % of energy compared to the previous fluorescent tubes that were constantly burning at full power. 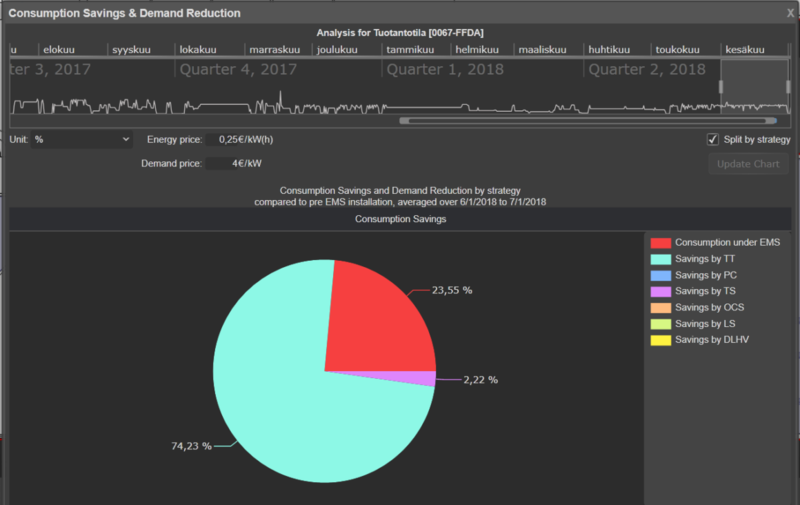 Energy saving reports can be accessed straight from the 3D Polaris software of ENCELIUM™ light management system. Apart from reports, the system makes it easy to adjust and tune the lighting to fit each task and each environment. If there’s a darker corner somewhere or a working task that needs special kind of lighting, each luminaire may be programmed individually. The data of each individual luminaire even evaluates the lifespan of the luminaires and alarms if there are any problems or haulage needs. The predictability and flexibility bring added value especially with retrofitted facilities, where the lighting often includes both older and newer lighting points. In 2019, Greenled will open up new office and production facilities designed to fit the company’s strong growth. Naturally, lighting design for the new facilities will be taken to a whole new level.